Considering we live in the suburbs, we have a decent amount of land. It’s not like we’re on a couple hundred acres in the sticks (I wish), but 1/4 acre in the middle of the city is a good place to start. The big obstacle we face is the number of trees in the neighborhood. The create a number of obstacles for growing, including the ph change in soil caused when the needles fall, and the face that tall, tall tree block out a lot of sun. Consequently, we spend a lot of time tracking which areas get light, how much, and at what time(s) during the year. Hands down, the best spot on our property in terms of sun exposure is at the curb where our water main (and our neighbor’s) is located. Our house is close to 40 years old, so the concrete housing protecting the main and water meter was sunk down and filled with sediment. My project for this past week has been to pull out both covers–can’t do ours without doing the neighbors–, build a retaining wall, and replace the compacted clay soil with fresh, dark soil ready for planting. Cottage stones we pulled out of a different part of the yard years ago and have been holding onto because who throws away stuff like that? It’s expensive! Gravel (5/8-) that was leftover from a project completed earlier this summer. Compost created in our worm compost bin. Sand, also leftover from another project. A couple of shovels and a pick ax. A metric ton of sweat. Lily after our first day of digging. The first, and longest, stage of this project was digging out the existing soil. 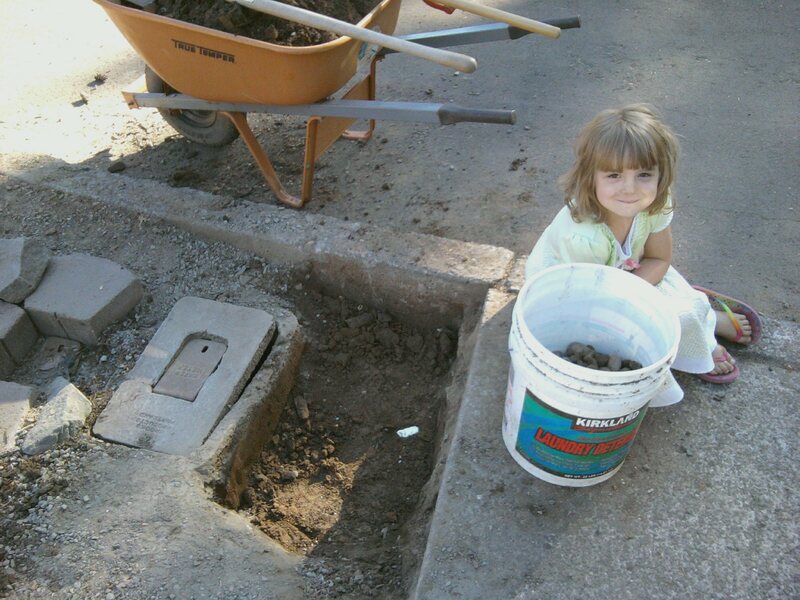 For some reason, I’ve spent a lot of time this summer digging holes. My shovel and I are old friends at this point. This small plot of dirt was straight up gardener’s hell. The top layer was compacted 5/8- (crunchy gravel), below that was a layer of river rock (smooth gravel), and beneath both of those layers was hard, compacted clay. Eight of the ten hours needed to complete this project was spent digging (and cursing the unforgivingly hard soil and my slow progress). In the first day we pulled out (and saved) 1/2 – 2/3 of a 5-gallon bucket of river rock. We’ll use these for another project soon, no doubt. As you can see from the photo, we made very little progress the first day. That hole is the result of two hours worth of sweat. Three days into the digging and we still had a lot of project ahead of us. By the end of day three, we still had a long, long way to go and I was beginning to doubt we would finish in our alloted time frame. Notice in the picture how out of whack the meter covers are. They look like drunken little cement barracks. When I started the project on Monday, my goal was to finish by Friday, Saturday at the latest. Our first major setback came in the form of a lost day of work. On Wednesday, we realized at the last minute that our employee was not available to work that day. When my partner should have been leaving for work, she was instead on the phone trying to sort out what was going on. Luckily, my oldest niece was available and willing to watch the kids so I could trundle off to Portland to spend the day at Ding Dong Daddios rather than shoveling in our yard. At that point I decided I probably wouldn’t finish before I had to return to work the next Monday. On Thursday & Friday, we got a little unexpected help from our neighbors that put us squarely back on schedule. On Thursday morning, after I’d wrapped up for the day, our neighbor, owner of the second water meter box, came out and worked on her cover for a while. She loosened her, and by default mine, to the point where they could easily be lifted out. She also set and leveled her so that all I had to do was backfill with gravel and level mine to match hers. She did hers a little differently than I had planned, but the end results were the same. 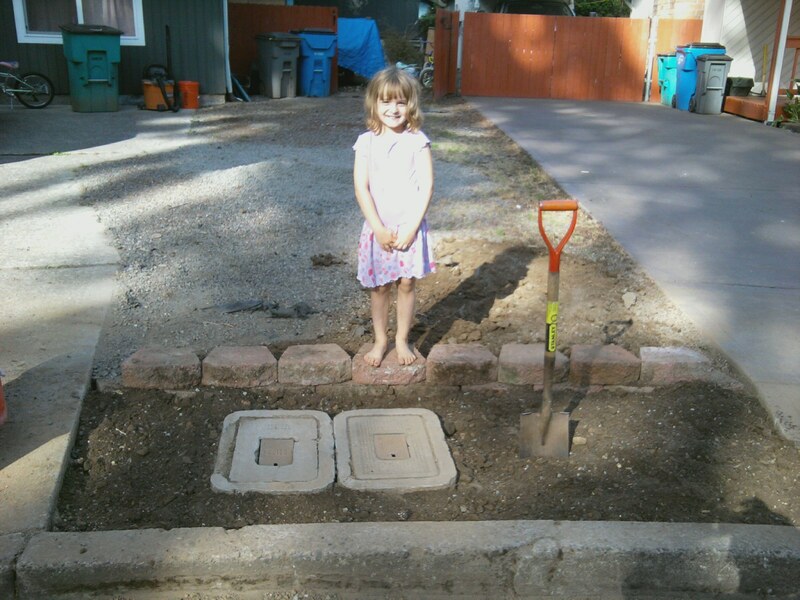 She took a few bricks and set them on the compacted clay soil and used those to level and raise the concrete cover. To protect as much as possible from shifting, I filled the gaps beneath it with gravel. For my concrete cover, I treated it just like a concrete manor stone and used only the gravel to set and level it. We completed this prior to digging out the remaining section (to the left of the covers in this picture). Of Friday–functionally day 4 of the project–the neighbor came out as I was getting ready to start. This time she brought along her fiance and he brought along a pick ax. What would have taken me two more days (at least) took him about 30 minutes. I was GIDDY. After the hole was completely excavated, they went off on a morning hike, and I set to work amending the soil. Please, keep in mind I’m not a scientist or horticulturist. I’m a wannabe urban farmer. That means I’m willing to work hard and learn as I go. Amending the soil was a guessing process. I filled my wheelbarrow between 1/2 & 2/3 full. Then I added two shovelfuls of sand, two of partially composted bark chip, a couple of small gravel, and my favorite part, some fresh compost from our worm bin. Mixed it all together with my shovel, then back filled the hole. 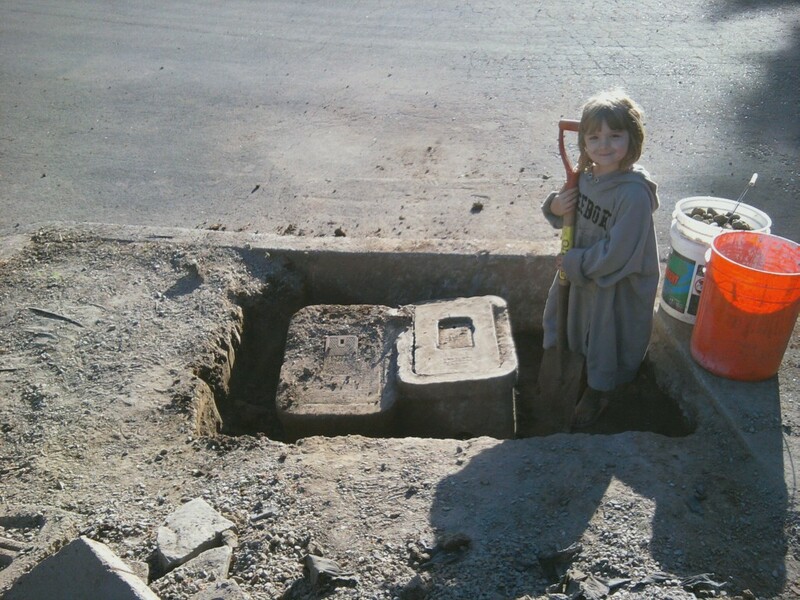 It took about 6 full wheelbarrows to fill the hole back in. The final stage of the project was to build the small retaining wall behind it that will protect the strawberries from careless drivers–did I mention that this area is between two driveways? The reason the soil was so compacted is because it’s been driven over more times than I can count. This morning heralded more digging, thankfully on a much smaller scale. 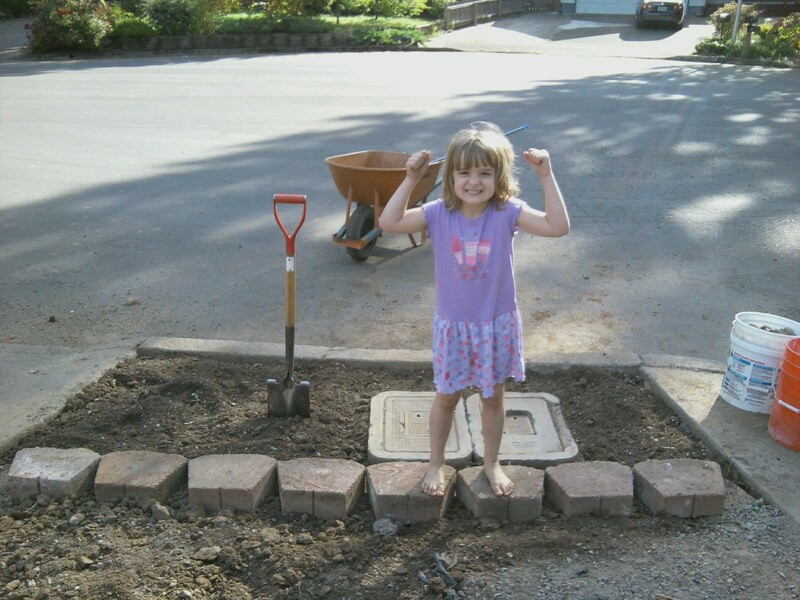 My daughter–who is five and very industrious–and I set about with the borrowed pick ax and a rock hammer, and trenched out the strip where the wall was to go. Then we put in a layer of gravel, got out our trusty level, and built a wall. Cottage stone by cottage stone. Cottage stones are smaller and easier to work with. They weigh only a couple of pounds each and are easy to pick up and move around, unlike their bigger, bulkier cousin, the manor stone. Lily posing in victory after conquering the wall. Building the wall was by far the fastest part of the whole project. That stage took about 20 minutes. Then we added one more wheel barrow full of amended soil and viola! Next spring, when it’s time to plant the strawberries, I will probably need to add a little more soil due to settling. I’ll also add either some bird netting or chicken wire to keep the squirrels–of which there are 5,000 in our neighborhood–from eating the plants before they have a chance to produce. I plan to plant a combination of June-bearing and ever-bearing plants so we will have a nice crop all summer long. Hopefully by the end of next summer I’ll have pictures of beautiful strawberry laden plants to share with you all.